Audio : On board ESS ES1869. Cache : 512 kB Pipeline Burstcache integrated on motherboard. Not upgradable. 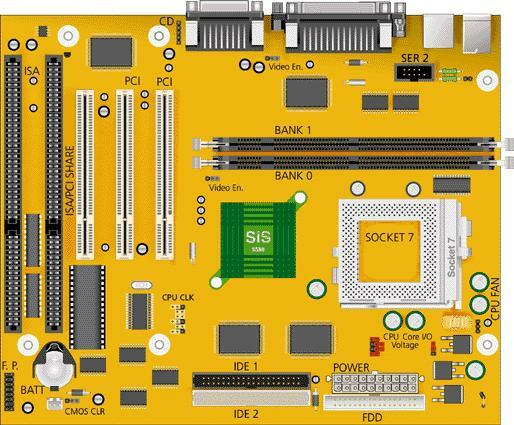 Chipset : Sis 5598 ISA/PCI chip. CPU Support : Socket 7 processors: Intel Pentium 90-233 MMX, Cyrix M2, AMD K6-2. Expansion Slots: 1 ISA slot, 2 PCI slots, 1 shared ISA/PCI slot. RAM : 2 DIMM sockets supporting single or double-sided SDRAM up to a maximum of 256 MB. Video : Integrated in chipset, uses main RAM as video memory. Supports only non-parity DIMM modules. The 168-pin DIMM sockets will accept 3.5 V 1 MBx64 (8 MB), 2 MBx64 (16 MB), 4 MBx64 (32 MB), 8 MBx64 (64 MB), and 16 MBx64 (128 MB) DIMMs. Bank 0 will be populated as the default from the factory. No configuration jumpers: BIOS detects memory size, and memory type. This motherboard will not accept 36-bit DIMM modules (parity). The video controller is integrated on the motherboard and the amount of video memory (4 MB) is not upgradeable. This system has 512 KB cache memory integrated on the motherboard and it is not upgradeable. When upgrading the CPU, use the CPU Clock Selection jumpers (JP14, JP15, and JP16) to set the host bus frequency and the CPU/Bus Speed Selection jumpers (JP1, JP2, and JP3) to set the clock multiplier.